The Newhouse Wolf wrench, first offered by Oneida Community in 1895, was designed by Ernest Seton Thompson, a trapper as well as a legendary outdoor writer and illustrator. Among other accomplishments, Thompson is credited as one of the founders of the Boy Scouts of America and as one of the original authors of The Boy Scout Handbook. 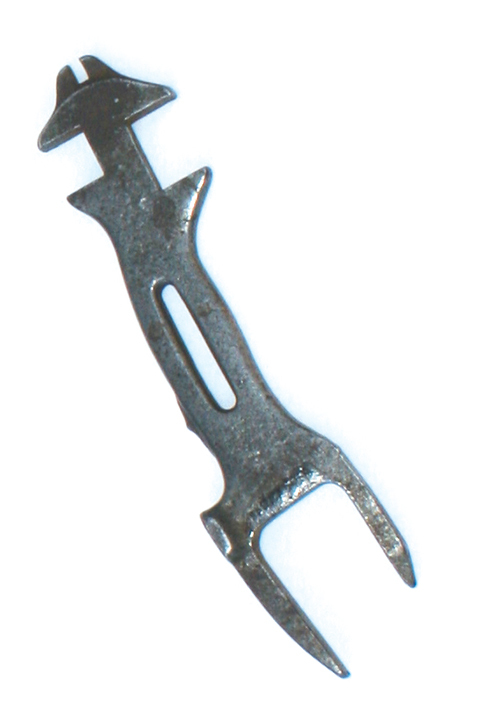 With a pair of these wrenches a trapper can set a wolf trap in a fraction of the time required by the use of the clamps. 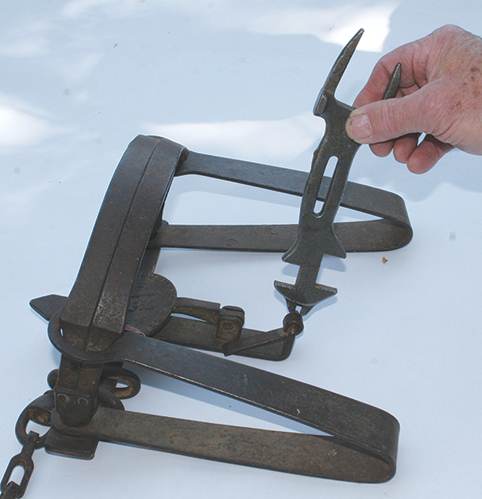 In setting the trap the foot should be placed as near the jaw as possible, and when the spring is pressed down to the top of the jaw post the wrench can be easily slipped on the spring between the foot and the jaws. The two smaller wrenches at the other end are for use on the jaw post nuts of both the Wolf trap and the Newhouse No. 4. The small open slot in the end is for bending the dog, and the flat surface near the lower prong of the spring wrench is a hammer. The long slot in the middle is for a carrying strap. Even though the wrench was offered from 1895 through 1930, it likely never was a big seller and only a handful are known to be in trap collections today. Because of the direct association with Thompson, collector interest is always keen, and a genuine Oneida wolf wrench may bring up to $1,500. However, there are no verifying marks on the wrench, and reproductions have been made both in brass and possibly cast metal, so buyer beware.